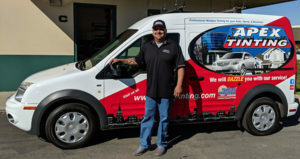 Apex takes pride in being the best quality auto glass chip repair people in Atascadero. The reason we are the best is simple, we are completely dedicated to our customer’s complete satisfaction, and we won’t rest until we have achieved that. We have low rates, friendly staff, speedy technicians, and we get there when we say we will. That’s right, we will come to you in Atascadero! Most glass chips and cracks can be taken care of right there on the spot, no missed work or inconvenience. Small auto glass chips can easily become larger and cost more when not taken care of soon, so we make it easy to get yours fixed right away – no more excuses! How can I tell if my car glass chip can be repaired? Luckily most car glass chips can be easily repaired by Apex! Here are some things to consider; if the chip is no larger than the size of a quarter, and if it is somewhere besides right in the driver’s vision, then chances are we can repair it! If on the other hand, your auto glass crack is larger or is in the way of the driver’s visibility it may need to be replaced. But don’t worry Apex handles that too! We are all concerned about our time these days, but when it comes to repairing the chip in your car glass you don’t have to worry about it taking a lot of time! Apex will handle it, in most cases, in under 15 minutes! Even multiple chips or a needed replacement will not take as much time as you think! We are professionals and we get the job done quickly and efficiently! Contact us today and a technician will be sent to give you a free windshield assessment!